trash: Prevent an installed program or an installed piece of hardware from being trashed. The life expectancy of a jacked construct is about that of a mayfly. In other words, short. Wow, loads of reviews of Sacrificial Construct! I'm actually running it at the moment in a janky but reasonably successful deck, so there's a couple of things I think I can add. Lynx Kurenko mentions SacCon's utility as double resource fodder in Hayley. I think that observation should go hand in hand with a mention of the fact that Aesop's Pawnshop drastically reduces the opportunity cost of playing such fodder cards. Don't need SacCon this game? No problem. It's an Easy Mark. I'm not a big fan of using this to recur Faerie. In that case the same influence and slot could be used for Mimic, which supports Faerie really well on a permanent basis. I also agree that it's no replacement for Sharpshooter given the number of commonly played multi sub destroyers. But if you've got it in your deck, then sometimes it will be better than either of those cards all on its own. If you're playing against Blue Sun: Powering the Future for instance, you can use this to face check without fear of Nebula, Grim or even a sneaky Wormhole piggybacking a trash routine from somewhere else. That's not nothing. Against Power Shutdown it's fine, but then practically anything cheap and disposable does that job. Shapers commonly have Clone Chips and SModCodes lying around, so they have some natural protection anyway (although if you do get a SacCon out, you don't hate protecting those options). Protecting Clot is obviously good, but again Clone Chips do that job for you without you having to slot a card purely for that purpose. One argument in favour of SacCon for Clot is the timing of the Corp's turn. Because they choose the order of simultaneous effects they can trash an installed Cyberdex Virus Suite to create a window for scoring fast advanced agendas that beats a clone chipped clot. In the same situation, SacCon offers no such window. I think the card that really makes SacCon worth considering right now is Marcus bloody Batty (that's his technical name). He's common at the moment and he will ruin your day in a way that no breaker can answer. SacCon counters one of his strong options, and for that I am profoundly grateful to it. Overall, I think SacCon is good enough as a marginal utility/silver bullet card in a deck that's mostly planning to sell it to Aesop's a solid 60% of the time. This card synergises in a Armand "Geist" Walker: Tech Lord deck because protecting the program or piece of hardware also gives you a card to draw. At only 1 inf, it might not feel like too much of an imposition in Criminal. Given the picture it's a little strange that it's a resource rather than a piece of hardware itself. (If it was hardware, it would be vulnerable to Power Shutdown, but it's uses of Power Shutdown that it deals with, so that's hardly a downside. This cute Blue Sun deck is an example of something you'd want to defend against. While the idea of being able to protect programs and hardware seems like a very strong ability, it hasn’t seen a lot of play. This is likely to the fact that it does not actively advance the runner’s win strategy, rather reactively replying to the corp’s strategy. Given that not all corp decks will be actively trying to trash programs, it makes it a difficult card to include. Most program trashing comes from ICE; because those ICE are almost always Destroyers, cards like Sharpshooter not only protect the runners programs, but also allow the runner to get past that ICE further advancing their win strategy. The Hardware protection has yet to see a lot of use, but that is where Sacrificial Construct may see some play in the future. Up until now, most hardware destruction was found in Weyland ‘Tag and Bag’ decks, which were looking to destroy Plascrete Carapace in order to ensure the kill. Most decks don’t include a lot of hardware outside of a Console, and that makes it difficult for the corp to justify a lot of hardware destruction if they aren’t aiming for a kill. Cybernetic Hardware might change the thought process on this card. 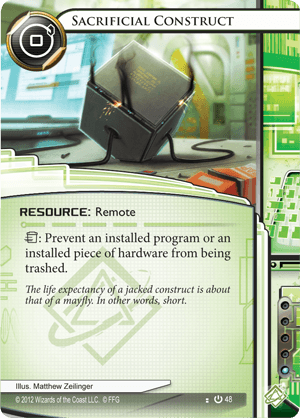 These are cards that have a cost to install, but provide a nice benefit - If they become prevalent enough, or the corp starts to see them as a threat, hardware destruction could make more of a splash. If that happens, Sacrificial Construct will gain more of a use as well, if just because recurring and playing Cybernetics again would probably not be worth the cost. I feel SC's best use at the moment is as a cheaper Clone Chip for anyone relying on Clot. While it lacks the instant speed of Clone Chip, the Corp will still know to expect it and start playing around it. So why not save Clone Chip for a disposable program like Parasite, trashable or Dogbreaker, while having a SacCon in play to save that Clot? SacCon essentially guarantees that the corp must spend two turns at least (plus any extra SC) purging if they want to FA without Psycho. At 1 influence it can even replace / supplement Clone Chip in most Anarch decks. In Criminal it can extend the shelf life of Faerie for more facechecking, and allow you to run without fear alongside your Autoscripter. In Clot-dependant Hayley builds it functions as a free double resource fodder AND has the same benefit mentioned in paragraph 1. And now that Power Shutdown is rising in popularity, this can also waste some Corp cards. SacCon is looking pretty good if you ask me.